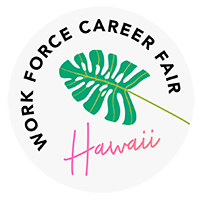 This is the official site for WorkForce Career Fair, Hawaii’s largest hiring event! We work with hundreds of employers all over the state and beyond to provide local job seekers access to the best opportunities. Want to be in the know about the upcoming event? We help employers save time, money and stress during their recruitment process! Over the past 20 years the WorkForce Career Fair has evolved to include new technology, strong local partnerships and thriving attendance. Though we are in a digital age where everything is available online, there is no rivaling the value of in person interaction, which is why we believe the fairs have stood the test of time. We challenge ourselves to make each fair even better than the last. Our last fair included over 300 employers and 5700 attendees! As either a job seeker or employer, participating in the career fairs will allow you to have a better pulse on the community needs, strengths and challenges. We hope to see you at a fair soon!